Resistance Standards - Current Shunts - High Voltage Dividers | Ohm-Labs, Inc.
Ohm-Labs is the only USA company to focus exclusively on resistance. We work to continuously improve the performance, accuracy and stability of our metrology grade standards. 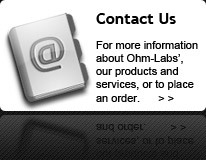 Ohm-Labs manufactures Standard Resistors from 10 micro-ohms to 10 teraohms; Precision Current Shunts , and High Voltage Dividers. All products are supplied with ISO17025 accredited calibration. Ohm-Labs' mission is "Excellence in Resistance." We welcome any inquiries you may have concerning resistors.